It seems that with every passing day as of late, yet another piece of my childhood becomes a distant (or in this case, defunct) memory. Without much warning, today workers at California-based Mother’s Cookies were told that the cookies would no longer be made. This should not come as much of a surprise considering that the 94-year-old company had recently filed for bankruptcy protection but still, this is a blow for their employees and the consumers who loved their products. I am one of them–consumer, that is. When I was growing up, my family ate Mother’s cookies religiously: Flaky Flix, Iced Oatmeal…you name it, we ate it. One trip to Lucky’s was all it took to make us happy. But one of their products in particular remained my favorite well into adulthood. 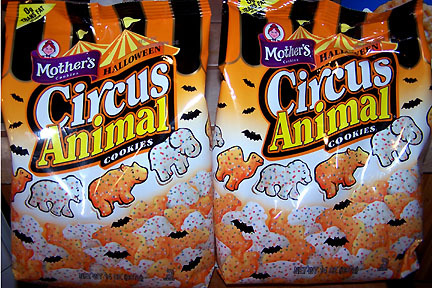 People, I’m talking about Mother’s Circus Animals (not to be confused with those mundane Nabisco Animal Crackers). Rather than being boring like Nabisco’s product, Mother’s little animal-shaped cookies were dipped in a white or pink frosting then dotted with colorful candy sprinkles. And man, anybody who says they don’t like them is either a liar or Nazi. We each must have consumed a veritable barrelful of said cookies when we were kids and they continue to be popular to this day given the inventory at local markets. They are addicting (and fattening) as heck. But I suppose even eating our own weight of the things does nothing to even the economic scales and combat the company’s ever-increasing expenses, as was evident by Friday’s announcement. Sure, there are other similar products on the market and I have tried them all–much to my disappointment. Circus Animals are something you just don’t mess with, like those Pepperidge Farm Goldfish knock-offs called “Dolphins and Friends.” They are terrible even if you don’t like the real Goldfish. Seriously, why bother? Even little kids will know the difference! Simply stated, nothing beats the original. So when I get home (I’m composing this on the train via iPod Touch), it’s off to the store to see if maybe, just maybe, there might be one or two bags left for my family. I’ll then crack one open for the last time, spread the love around, and regretfully tell Anthony that we’ll never have the absolute pleasure of tasting them ever again. And with the holidays approaching, that means that this combination of ingredients won’t be made into frosty wreaths and candles, either. I’m officially bummed out now. Thanks, Mother’s Cookies and to all involved in the production of these iced cookies. You will definitely be missed! UPDATED 10/14/08 @ 8:10 p.m. Success! One trip to Ralphs was all it took. They’re not the traditional pink and white variety but hey, the flavor is still there. And they are as good as ever. This entry was posted in 70s, Economy, Flashback, Food, Life and tagged childhood, childhood memories, cookies, Food, mother's cookies, snacks by Dave. Bookmark the permalink. Although I’ve never had these cookies, I do feel your pain. Eating yummy little cookies is what being a kid is all about. And now, future generations won’t be able to eat those yummy little cookies. I’m salivating just at the picture of those cookies. Aye, ’tis a sad day indeed. I weep for the future. Many years ago at a tradeshow my booth was next to Mother’s Cookies. They were the BEST cookies ever. How sad. But not as sad as you are going to be when the Dodgers lose their 4th game!!!! I’m from the UK and I eat pearl drops on the weekend and it really made me think of my childhood, its surprising how a taste of a sweet can bring back such childhood emotions. During my weekly excursion to Albertsons in Lakewood I stumbled upon a Nabisco shipper that had product labled as Nabisco Classics. One of the products was Iced Animal Cookies. The picture of the cookies on the bag looked like the Mother’s product so I figured I should buy a bag just to make sure they did the original justice. Do you know what? They taste identical to Mother’s. They have the same pink and white icing and the colorful sprinkles. They even use that pinkish-purple label on the bag. I have a bag of original and Halloween varieties in the pantry, but I think I will take you up on your suggestion to try these. I hear that another cookie company has bought the “formula” and will begin producing them. Might even have been Nabisco.